One of the most popular JCH programs, the Swimming Academy holds daily classes for children from 2.5-14 years old. Kids not only learn to swim, but they also build up their confidence and have fun doing it! Our enthusiastic professional instructors teach small classes and get results in just a few months. Registration: Classes fill up quickly on a first-come, first served basis, so please register early. 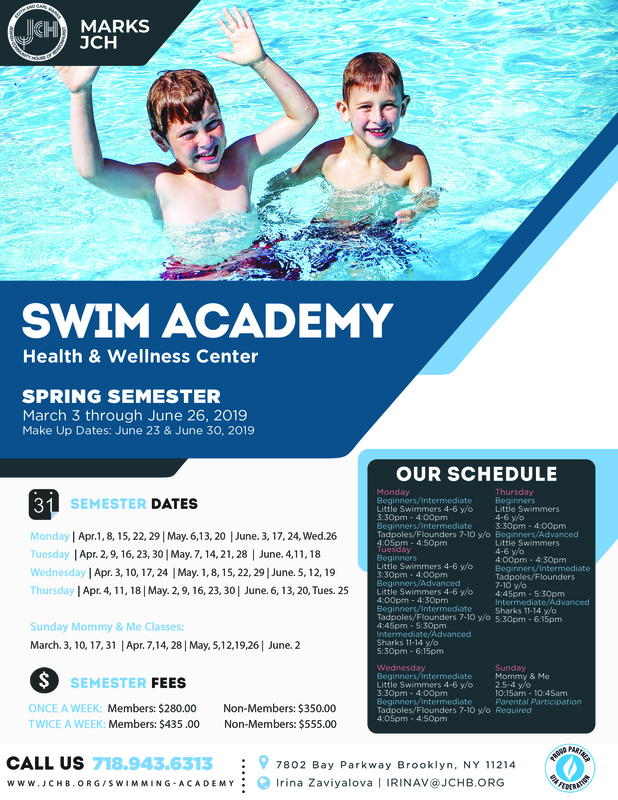 Information: Contact Irina Zaviyalova, Aquatics Director at 718-943-6313. Requirements: The prerequisite for each level is a successful demonstration of the skills learned in the preceding level. Tuition is paid upon registration for each semester. All payments must be made in full at the time of registration. Each semester consists of 12 classes. Classes are 45 minutes long for kids 6 and up and 30 minutes long for 18 months – 5 year olds. Membership rates apply to Children and Family members. Please read our payment policies.